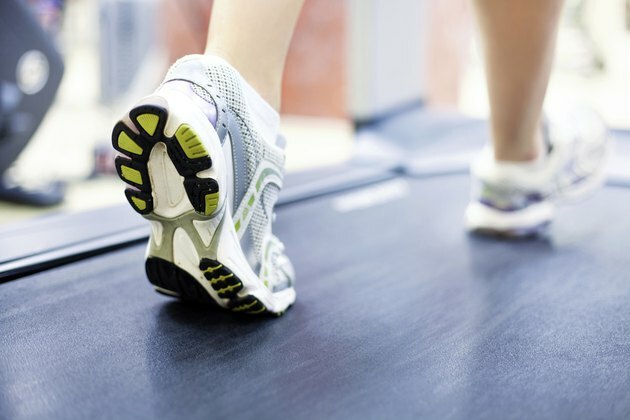 Treadmill walking can be less damaging to your joints than walking on the ground because most treadmills have shock-absorption features. The best treadmill walking shoes should complement your stride by providing comfort, proper fit and cushion. These characteristics can prevent calluses and blisters and are likely to help you stick with your walking exercise program. This shoe is best rated for its stability due to its Impact Guidance System, which enhances your foot’s natural gait for heel-to-toe walking with a high degree of shock absorption. A ComforDry Sockliner helps to keep your feet dry and prevents your socks from slipping off your heels as you transition between different paces of walking. The laces are designed asymmetrically for a comfortable upper fit while minimizing the chance for irritation or loss of circulation to your feet or ankles, says roadrunnersports.com. Nike’s Air Vitality walking shoe is designed to provide comfort, stability, cushion and support for all intensities and lengths of strides. The upper front part of the shoe is made with breathable mesh material and flexible leather to provide a snug fit for your toes. A Phylon midsole encourages a natural stride while your heel is enclosed in Nike’s Air Sole for added support, says the website 6pm.com. This breathable lightweight shoe is made with forefoot flex to give you the support you will need for fitness walking. The Nitracel Cushioning Cartridge at the heel and skeletal support throughout ensures a smooth heel-to-toe gait. The manufacturer's website says the four-piece solid rubber outsole has balanced groves to keep your ankles in line with your knees and prevent injuries or pain to your joints on contact with the treadmill. The slanted heel of this shoe is ideal for walking because it propels your stride forward and keeps your heels, ankles, knees and hips in alignment. The leather and mesh combined with the Opti-Flex Zone adds more forefoot flexibility and support, according to the Reebok website. This lightweight walking shoe was designed with the flexibility and feel of a running shoe and the heel-to-toe support and cushioning of a walking shoe. This combination is ideal for a variety of walking paces and treadmill interval training. New Balance’s Walking Strike Path stabilizes your foot and the seamless Phantom Liner reduces the weight of the shoe to take the strain off your ankles. Abzorb cushioning in the heel and the forefoot are shock absorbing to prevent joint discomfort, the manufacturer says.